Parokya ni Edgar was the big winner at the MYX Music Awards 2012 held at Music Museum Greenhills on Tuesday, March 13. The rock band bagged six awards, including Favorite Group, Favorite Song (for "Pangarap Lang Kita"), and Favorite Collaboration (for "One Hit Combo" with rapper Gloc-9). Parokya also bested Somedaydream, Christian Bautista, Yeng Constantino, and Gloc-9 for the Favorite Artist award. 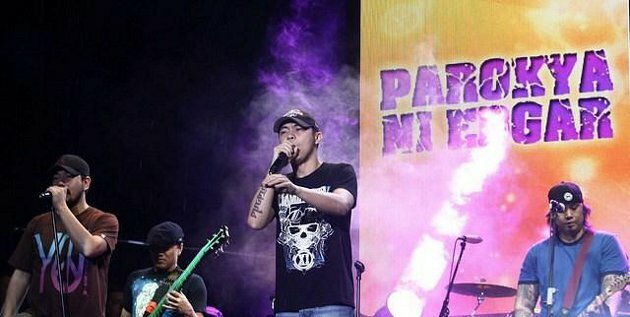 Among their seven nominations, Parokya ni Edgar only failed to bag the award for Favorite Music Video category, which went to "20/20" by the band Pupil. The night was also a big one for Gloc-9, who won Favorite Male Artist and Favorite Mellow Video (for "Elmer"). Last year's MYX Music Awards big winner Yeng Constantino received Favorite Female Artist award. Zia Quizon was proclaimed Favorite New Artist category, beating favorite Somedaydream (who has seven nominations) and Ebe Dancel (who was nominated for his first solo album which was released last year). Ryan Cayabyab got the MYX Magna Award for his contributions to the music industry for more than three decades. "Tatanda ka rin, Chito. Ebe, tatanda ka rin. Yeng, tatanda ka rin," Cayabyab said when he received the award. "This is a very heady feeling. Kaya ko sinasabi yun kasi, sigurado ako, 20, 30 years from now, nandito kayo, sinasabi niyo rin ito." "We just want to work. We just want to keep pushing OPM. That's what I'm doing now," Mr. C, as he is called in industry circles said in an interview with the press after the ceremony. He added that Filipino music is on its way up. "Ang feeling ko paakyat na tayo ulit, pero naghahanap ng bago," he explained. "Kasi parang it's ripe for maybe a new genre, a new sound." Winners of the MYX Music Awards 2012 were determined by online votes and artists' poll.